D. Foster & Associates Ltd. The photo you see on the cover of this month’s SEMA News was taken in the newly completed SEMA Garage photo studio. 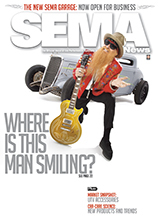 It’s a shot of rock guitarist Billy Gibbons, who was kind enough to pose with his project car, which SO-CAL Speed Shop is preparing for the 2014 SEMA Show. Gibbons was on hand to view progress on the car, confer with SO-CAL designer/builders Pete Chapouris and Jimmy Shine, and to tour the SEMA Garage, which is now officially open for business. Morris 4x4 Center is a pure-play Jeep parts and accessories Internet retailer—which accounts for 98% of all sales—and is housed in a 32,000-sq.-ft. facility in Pompano Beach, Florida, with 70 employees. It started as a 6,500-sq.-ft. warehouse complex with six units. Every few years, the company expanded into another unit. In November of this year, Morris will move again, this time into a 60,000-sq.-ft. facility. In many ways, developing a strong web presence has become a whole lot simpler. In other ways, it can be more confusing than ever. SEMA research indicates that more than a third of automotive accessory enthusiasts are likely to own a powersports vehicle. That means the powersports market offers great crossover potential for aftermarket businesses catering to other specialty-equipment segments. So what’s one of the hottest trends in the powersports arena? The SEMA-commissioned report notes that approximately 670,000 UTV models were sold from 2010 to 2012. This is consistent with other market analyses that have predicted continued healthy growth of the segment through 2015. Data Receivers: Now Is the Time to Speak Up! July marks the end of the first full year of operation of the SEMA Data Co-op (SDC) Product Information Management System (PIMS), and this fledgling new business is well on its way to becoming what we intended it to be—the definitive centralized product data repository for the SEMA marketplace. Now hosting more than 300 supplier brands of data, 2 million part numbers and more than 30 million vehicle application records, the SDC is a legitimate and valuable source for product data to power wholesale distributor (WD), retail and web businesses. SEMA Garage: What’s In It for You? The compelling image you see on the cover of this issue was a byproduct of a visit by the world-famous SO-CAL Speed Shop crew. They came by to check out the newly completed SEMA Garage and to touch base with one of their celebrity clients—rock guitarist and legendary car collector Billy Gibbons. SO-CAL was among the first of many SEMA-member companies that will use the tools and facilities we have assembled in the SEMA Garage. The SO-CAL team took advantage of the SEMA Garage FaroArm laser scanner to capture the exact curvature of the ’34 Ford’s sleek body panels to quickly fabricate a new custom trim piece. It’s an example of how the latest scanning and rapid prototyping tools can revolutionize the way our industry develops products. Like many other leaders in the automotive specialty-equipment industry, Steve Matusek started small. He formed Aeromotive Inc. in 1994 in Lenexa, Kansas, with dreams of applying aerospace techniques and processes to high-performance automotive fuel systems. The company blossomed by relying on three generations of engineering and racing experience. It is now a leading designer and manufacturer of fuel-delivery systems for racing, street and marine applications. Like all niches of the auto hobby, off-roading is an activity enjoyed by countless enthusiasts and families all over the country. Responsible use of off-highway vehicles (OHVs) allows individuals and families to enjoy all that America’s landscape has to offer on two or four wheels. With increasing frequency, however, enthusiasts are encountering “road closed” signs on public lands. This is often the result of the U.S. Congress passing legislation establishing “wilderness” areas. Cadillac ATS-V, Land Rover Discovery Sport, ’15 Ford Mustang, and Dodge Challenger SRT8. New-Generation SVO Mustang, Ford Raptor Mule, SRT Challenger Hellcat, and GM Colorado, Canyon Diesel With VW Amarok. Breaking news from SEMA members, including Wes-Coast Marketing, Holley Performance Products, Midwest Truck & Auto Parts, Flex-a-lite, Fidanza Performance, The Society of Collision Repair Specialists and more. Ford Motor Co. has made CAD information available for the ’15 Mustang and F-150. The data is accessible to SEMA manufacturing members who are subscribed to the SEMA Technology Transfer program. The program, which was established more than 10 years ago to help manufacturers minimize or eliminate reverse engineering for production, is available for $360 per year. Other OEMs that are part of the program include Chrysler, General Motors and Scion. Registration for the 2014 SEMA Show is open and available. The Show takes place Tuesday–Friday, November 4–7, in Las Vegas. Registration is offered in three categories: attendee, exhibitor and media. With an estimated population of 42 million, Central America is an increasingly important regional market for U.S. goods. The Dominican Republic-Central America-United States Free Trade Agreement (CAFTA-DR) eliminates trade barriers among the seven signatories, which include the United States, Costa Rica, the Dominican Republic, El Salvador, Guatemala, Honduras and Nicaragua. Before this regional trade pact, tariffs on U.S. autos and parts to the region had averaged from about 4% to 9% and even up to 30% on certain products. Most of these import taxes disappeared immediately with CAFTA-DR approval, and the rest will be eliminated by 2015. While negative online reviews can be completely unsubstantiated, businesses must face a hard truth: The Internet never forgets. Without a detailed strategy in place for dealing with negative reviews, a thumbs-down from a customer—or a series of customers—can stay on the web forever and consequently erode profits forever. From classic cars to today’s modern muscle, every automobile requires care, and each can also benefit from components that may subtly or outrageously change a vehicle’s appearance. At the 2013 SEMA Show, dozens of products were displayed under the car-care and restyling classifications in the New Products Showcase. The range of innovation ran from spoiler sunroofs and body side moldings to polishes, waxes and protective films. We’ve gathered the full contingent for your perusal here, along with comments on industry trends from a few executives who represent some of the industry’s leading car-care companies. Motorcycles, ATVs, UTVs, snowmobiles and personal watercraft—small on size, big on entertainment value. And the New Products Showcase at the 2013 SEMA Show was brimming with powersports accessories designed to boost performance, add functionality and enhance appearance. The next few pages highlight the new and featured products displayed in the powersports category of the Showcase. The 2013 SEMA Show featured literally thousands of cars. All kinds of cars. No matter what type you prefer, chances are it was on display at the SEMA Show. Whether it was Mustangs, Camaros, Porsches, Toyotas, Corvettes or something else, you were guaranteed to see the latest and greatest. These cars provide a canvas for the best in wheels, mobile-electronics products and LED headlights, just to name a few. At the 1973 Street Rod Nationals (or so the story goes), rod builders Andy Brizio and Lil’ John Buttera got into a, shall we say, friendly discussion about which end of the Golden State produced the best street rods. Southern Californian Buttera ribbed Brizio, who was from South San Francisco, about how the Bay Area cars were “average” mechanically but were topped by outstanding paint jobs to make them seem more special. Brizio, in turn, said L.A. turned out trick show cars that couldn’t be driven very far. One thing led to another and (so the story goes) the discussion devolved into a “my new car will be better than your new car” challenge.